Amravati division is formed by Govt. of Maharashtra on 1st of May 1981 This Revenue Division consist of 5 District Amravati In the central zone of India Known as Viderbha Region . Amravati Division is bound by Madhya Pradesh state to the north, Nagpur Division to the east, Andhra Pradesh state to the southeast, Marathwada region (Aurangabad Division) to the south and southwest, and Nashik Division to the west. Amravati is a city in the state of Maharashtra, India and the seventh most populous metropolitan area in Maharashtra. 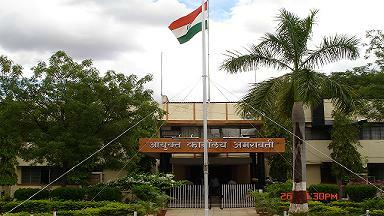 It is also the administrative headquarters of the Amravati district. Among the historical landmarks in the city are the temples of Amba, Shri Krishna, and Shri Venkateshwara. 1. Akola, 2. Yavatmal, 3. Buldhana and 4. Washim. Amravati Municipal Corporation, established in 1983, is the first Municipal Corporation in India, which has introduced privatization of octroi.